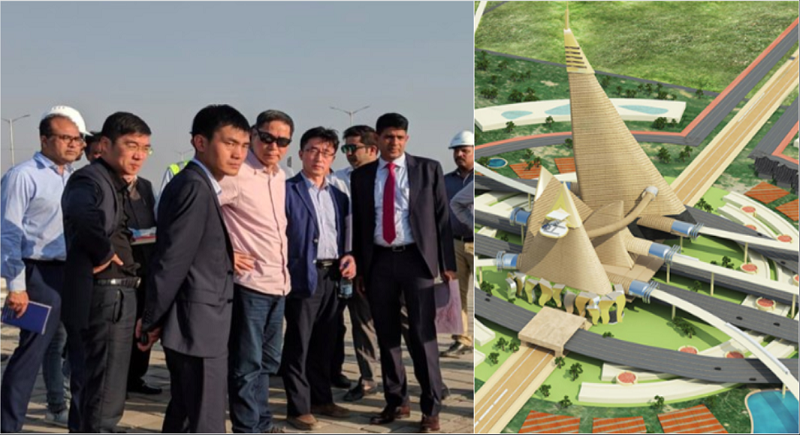 Gandhinagar, February 7: Evolving the Dholera SIR Project in Gujarat, the Chinese investors visited the site reviewing the progress and development of the first smart city in making. Mr Guangda Xiang, Founder and Chairman, Tsingshan industries from China visited the Dholera SIR site earlier this month to see bloom of key infrastructure. Chinese steelmaker Tsingshan Holding Group have decided to invest $3 billion in the project as announced by the founder Guangda Xiang at the Vibrant Gujarat 2019 summit in Gandhinagar last month. The company is also an emerging electrical vehicle battery producer and is considering setting up an electrical battery plant in Dholera to cater to the fast developing auto industry in India. The decision was taken after company officials and representatives visited the Dholera site. The investment will be made in conjunction with their Indian JV partner Chromeni Steel. The company is currently involved in the setting up of a major stainless steel complex in Mundra, Kutch district. It undertook this project after signing an MOU during the Vibrant Gujarat Summit two years ago. Within a year of signing the MOU, the company began the construction of the first phase of the project which completed in a record time of 14 months. Dholera SIR has been conceptualized as the first smart city of India, a city located in the dynamic state of Gujarat, all set to define how modern India shall look like in times to come. This project is a very ambitious and dream project of both central government and Gujarat government. A lot of development has to happen in Dholera to make it as a Smart City constituting the construction of a new International Airport, Metro train, DMIC, Power Hub project. Of the 100 smart cities to be developed, Dholera SIR Gujarat is leading the vision that the central government has weaved. With Rs. 3,000 crore in its kitty and land allotted by the state government, SIR Dholera has kicked off the trunk infrastructure. The city shall be connected via several modes including an international airport, high speed metro, 6 lane expressway, national highways, railways and port. The free access of Dholera SIR Gujarat to the world gives the city the strength to develop itself as a potential global trading and manufacturing hub.